This statement is made pursuant to the California Transparency in Supply Chains Act of 2010 which requires retail sellers and manufacturers doing business in California to disclose their efforts to eradicate slavery and human trafficking in their direct supply chain. This statement sets out of the steps taken by Givenchy SA and Givenchy CORP. (collectively, “Givenchy”) to ensure that slavery, servitude, forced or compulsory labour and human trafficking (collectively, “Modern Slavery”) is not taking place in any part of its business or in its supply chains. Givenchy CORP. (“Givenchy US”) is a subsidiary of Givenchy SA, part of the Louis Vuitton Moet Hennessy Group (“LVMH”). Givenchy US distributes premium apparel on behalf of Givenchy SA to clients in the United States including the State of California. Givenchy is among the most iconic brands worldwide and its unique positioning encompasses most high quality product categories, such as Haute-Couture, Women Men and Children’s RTW, Leather Goods, Accessories, Shoes, and relies on exceptional savoir-faire. Givenchy SA directly or indirectly manufactures, distributes and sells luxury Women Men ’s and Children RTW, Leather Goods, shoes and fashion accessories under the trademarks Givenchy or Givenchy Paris. Givenchy’s commitment is to act with integrity in all its business dealings and to promote ethical conduct to enhance compliance with applicable law and to provide guidance with respect to business conduct. Givenchy has a number of policies that are relevant to this commitment, which set out what Givenchy expects from its employees, internal business and its external suppliers. Givenchy expects its suppliers to share its commitments and to act in full compliance with all applicable laws, including all national, local and international laws relating to the management of their businesses. Givenchy requires its suppliers to seek approval before subcontracting any part of their supply chain process and Givenchy’s approval is subject to acceptance by the subcontractor of the Suppliers’ Code of Conduct and such other conditions that Givenchy determines. The Givenchy Code of Conduct includes relevant sections on “Honesty & Ethical Conduct”, “Compliance with Laws & Regulations”, “Safe Working Conditions” and “Sales & Commercial Transactions”. Givenchy expects its employees and suppliers to engage in and promote honest and ethical conduct, comply with all applicable laws, rules and regulations in their own area and act responsibly, with due care, competence and diligence when dealing with colleagues, customers, suppliers, agents and intermediaries. The Givenchy Code of Conduct reiterates the LVMH Code of Conduct and commitment to act with the highest standards of integrity, respect and engagement in our behaviours and in the way that we conduct business every day, everywhere. This Code of Conduct further states that the group companies will inform all of their commercial partners of these ethical principles and expectations and will ask its suppliers to comply with the principles set out in the Suppliers’ Code of Conduct. In particular, this code specifies compliance with social issues to abide, respect and adhere to the company moral and ethical values in the management of the company concerning human rights, working conditions and environmental issues. Givenchy has been carefully reviewing its suppliers and a lot of its suppliers are carefully chosen for the entire group by LVMH. 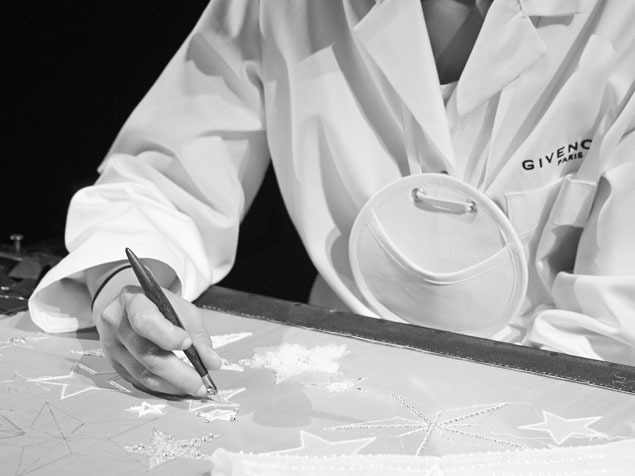 Givenchy reserves the right to check adherence of its suppliers and contractors to the principles set out in the Suppliers’ Code of Conduct and to conduct compliance audits. Upon reasonable request, Givenchy suppliers and contractors shall supply the necessary information and grant access to Givenchy representatives to verify compliance with the requirements of the Suppliers’ Code of Conduct. Suppliers and contractors shall further keep proper records to provide compliance with this Code and provide access to complete, original and accurate files to Givenchy representatives. Upon reasonable request, Givenchy suppliers and contractors must improve and correct any deficiency discovered during any such audits. Givenchy shall use its reasonable endeavours to ensure that all Givenchy supplier and contractor template contracts contain clauses requiring Givenchy’s suppliers and contractors to adopt similar anti-modern slavery standards and practices. Givenchy does not at this time provide company employees and management with specific training on human trafficking and slavery.